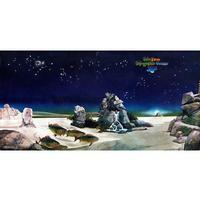 Tales From Topographic Oceans is the fifth in a series of remixed and expanded Yes classics. The album has been remixed in both stereo and 5.1 surround sound from the original studio masters by Steven Wilson, and is fully approved by Yes. Also includes the original mix in high resolution. The CDs feature the new mix of the original double album, an unedited / extended version of "Dance of the Dawn" (side one), and five newly-created “single” edits focussing on the song sections of the extended pieces. – 5.1 PCM Surround Sound (24bit/96khz) and in DTS-HD MA 5.1 (24bit/96khz). – Hi-res (24bit/96khz) 2016 stereo mix. – Original album mix in a hi-res flat transfer from an original stereo master tape source (24bit/192khz). We believe this is the earliest master of the original mix to be issued in the digital era. Presented in two digipack sleeves in a slipcase with new sleeve-notes by writer Sid Smith including elements of new interviews with Jon Anderson, Steve Howe and Alan White along with rare photos and archive material. 2016 full album mix, plus an extended Dance of the Dawn and 5 single edits, all mixed by Steven Wilson. 2016 album mix in MLP Lossless stereo and 5.1 Surround sound - mixed by Steven Wilson. Original album mix, flat transfer from source master tape. All material presented in 24bit/96khz resolution.